The Northeast Exchange Project (almost half again the size of the Millennium Pipeline) would run through Franklin itself and neighboring towns — if Route B is approved. 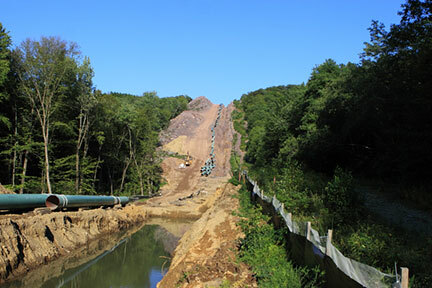 The Tennessee Gas Pipeline Company wants to build this line between two of its existing west-to-east natural gas pipelines: the Tennessee Pipeline #300 in Pennsylvania south of the Millennium Pipeline, and the Tennessee Pipeline #200 in New York along Route 20. Gas would then travel northeast from near South Montrose, Town of Clifford, Susquehanna County to near Central Bridge, Town of Wright, Schoharie County. The final destination for the natural gas is New England. Tennessee Gas Pipeline Co, LLC is a wholly owned subsidiary of El Paso Corp. Kinder Morgan Energy Partners, LP plans to buy El Paso this spring, forming the largest domestic natural gas pipeline company. All three companies have their headquarters in Houston, Texas. The Northeast Exchange would be a 36 inch pipeline with a carrying capacity of 650 million cubic feet per day and with a compression of 14,000 horsepower. Initially, new compressor stations would be built only at each end. As throughput increases, booster compressor stations could be built along the length — possibly one in Franklin. This project could cost hundreds of millions of dollars. Currently the company is fine-tuning possible routes. Once this is finished, Tennessee Gas Pipeline would begin the approval process by pre-filing with the Federal Energy Regulatory Commission, possibly in May. The schedule is for all permits to be obtained by late 2013. If so, ground breaking will begin in the first quarter of 2014 – only two years from now. Construction is scheduled to take less than a year, with the pipeline beginning to carrying gas by the end of 2014. However, deadlines could slip. In selecting routes, the company examines topographic maps and air photos, and takes helicopter surveys of the landscape. Franklin residents have reported numerous overflights. Also, Tennessee Gas Pipeline is consulting with the Department of Environmental Conservation. To date, there are two possible routes (see map). The initial route (Alternative A) is122 miles long (92 in NY) in a crooked line to the northeast. North of the Pennsylvania border, it would cross the towns of Hancock, Colchester, Hamden, Delhi, Bovina, and Stamford. Once in Schoharie County, it would turn north northeast across Gilboa, Fulton, Middleburg, Schoharie, and Wright. and proposed routes could be changed by El Paso before then. In the regulatory process, additional changes could be made by FERC. That route would have to pass though the watershed of the NYC Cannonsville Reservoir, cross over a NYC aqueduct, and under the Delaware River. After consulting with the DEC in early February, Tennessee Gas Pipeline proposed a second route (Alternative B) to the north of the first. This route would run 115 miles (87 in NY) north northeast across the towns of Sanford, Deposit, Masonville, and Sidney. To avoid the developed lands around Sidney and Oneonta, it would turn northeast and run below the East Sidney Dam and along the northwest slopes of the Ouleout Valley through Franklin and Meredith before jumping the ridge into Charlotte Valley, crossing Davenport and Harpersfield. The pipeline would enter the Susquehanna Valley at Richmondville and continue northeast across Summit, Richmondville, Cobleskill, Schoharie, and Wright. Nothing is set in stone. These routes could be modified by the company, FERC, or local activism, as we saw with the Marcy South power line. Yet a third route could be proposed for the Northeast Exchange. Nevertheless, surveyors are already asking permission from landowners for ground surveys. Once the route is certain, landmen will begin obtaining easements along the route. Easements for pipelines are nowhere as profitable as leases for gas wells. In Pennsylvania, landmen are paying a one-time fee of $5 to $25 per foot, the lower amounts being for rural land. There is little room to negotiate: when it cannot reach agreement with a land owner, Tennessee Gas Pipeline can use eminent domain to seize the easement. Some Town Supervisors in Delaware County have been briefed by Tennessee Gas Pipeline, including those whose towns could be crossed by the pipeline. Franklin Town Supervisor Don Smith was present, as was Franklin Mayor John Campbell. The company is handing out a color brochure to announce the project to landowners. The value of the pipeline infrastructure would increase property tax revenues. For the Town of Franklin, this might be a few tens of thousands of dollars annually. This might be partially offset by decreases in property values along pipeline. Staff at DEC have proposed to Tennessee Gas Pipeline that “host communities” receive some benefits in return, such as gas distribution lines, but this is unlikely. The preferred route, which goes through Franklin, avoids the watersheds of New York City reservoirs, thereby giving NYC water special protection once again. While the primary purpose of Northeast Exchange is to transport natural gas from Pennsylvania to New England, it could be used to collect gas from local wells. Should drilling for natural gas come to our neighborhood, typically the first wells would be sited along pipelines. Then a network of gathering lines will be laid to bring gas from wells to the pipeline, and more compressor stations must be built in Franklin, wherever gathering lines feed into the pipeline. If built, the Northeast Exchange could have a huge effect on the Town of Franklin for decades to come, and be far more consequential than the Marcy South power line. In late February, Cabot and Williams announced a second pipeline that would follow a similar route to Tennessee Gas Pipeline’s pipeline from Susquehanna County PA to Schoharie County NY. 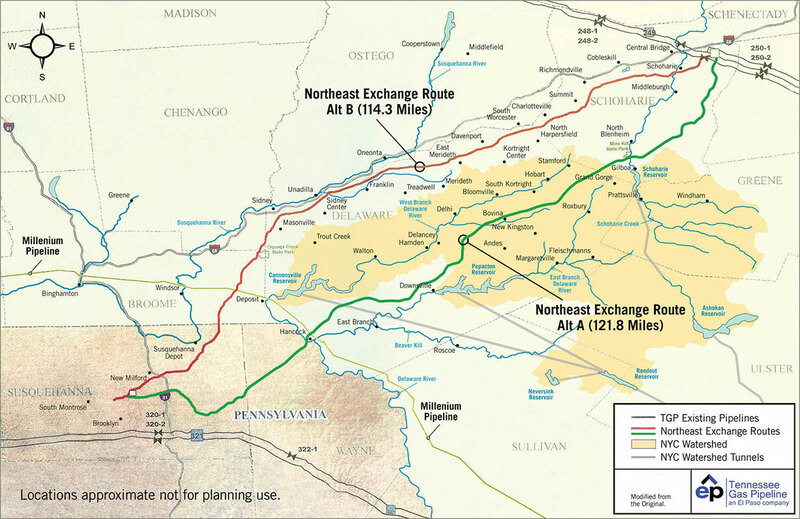 Running a bit west and north of the Northeast Exchange, this Constitution Pipeline would skirt most of Delaware County, crossing eastern Broome, southeastern corner of Chenango, western corner of Delaware, and southern Otsego Counties. To date, this Constitution Pipeline exists only as a press release and a request for “shippers, potential shippers, and interested parties.” This proposal decreases the certainty about where a pipeline would be built, but increases the odds that one will be built somewhere. El Paso has reacted by shifting resources from ground work to commercial development.